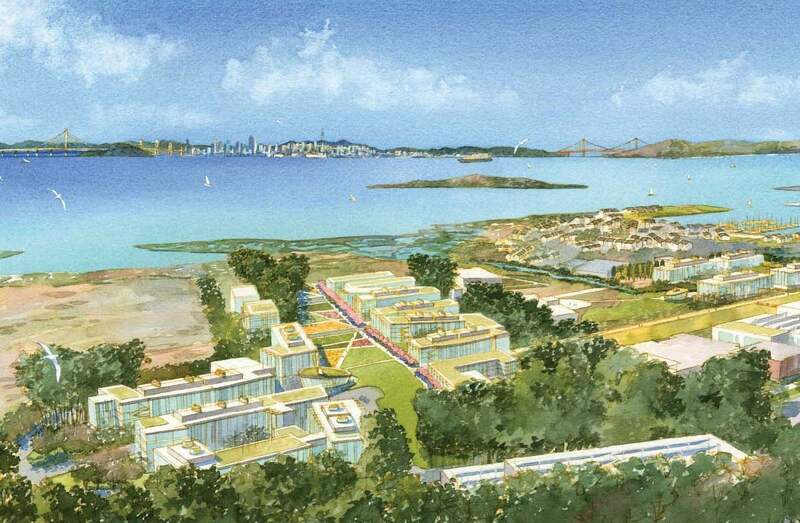 Lawrence Berkeley National Lab (LBNL) has narrowed its list of possible sites for an expansion campus to six. The Richmond Field Station area presumably is the leading candidate because it is already owned by the University. But there are five other sites making bids including ones in Alameda, Albany, Berkeley, Emeryville, and Oakland. There will be a series of meetings in each city to allow the community to hear about the proposed plans from LBNL and from the local developer. This project can have a big impact on the city of Richmond and we believe that Richmond citizens must understand and be involved in the project from the beginning. For this reason alone we believe that those concerned with the future of Richmond should attend the Richmond meeting this Thursday. Since much of the Bay Area media has given Richmond such a bad rep in recent years we also want to demonstrate widespread community support for this project. We understand that it is projects like this that can help move Richmond in a progressive direction. Unlike the Lawrence Livermore Lab, which focuses on defense issues, the Berkeley lab is a multi-program lab with research in advanced materials, life sciences, and energy efficiency. --The project itself creates construction and operation jobs. --The existence of the lab/campus will make nearby areas more attractive and help draw in the projects and money needed to clean up those surrounding lands. --The selection of Richmond draws positive publicity about Richmond and draws attention to the progressive policies of the city. In February the RPA issued a statement welcoming LBNL. 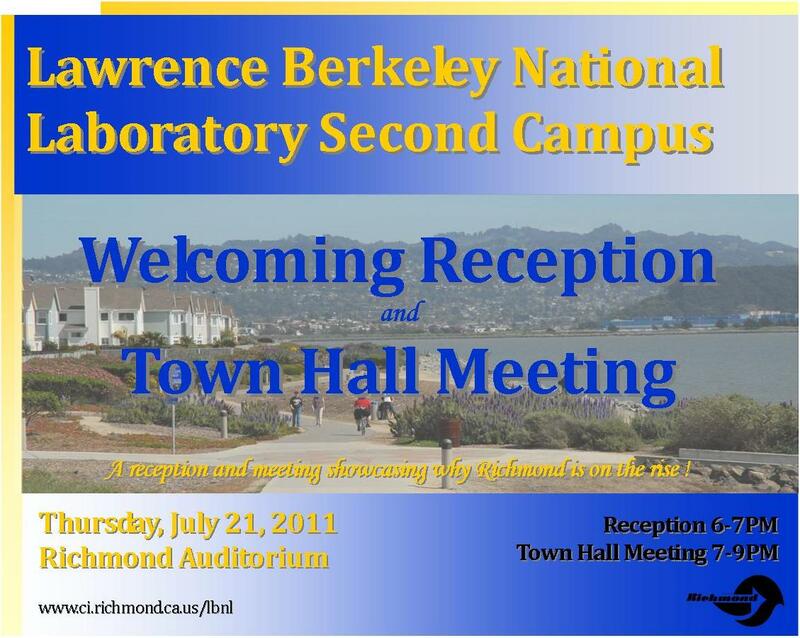 We believe that Richmond is on the rise, and that Richmond will contribute a lot to LBNL and its staff. Here is that statement. Organizers from ACCE (Alliance of Californians for Community Empowerment) and about 50 community members took city officials on a "blight tour" of North Richmond. City Manager Bill Lindsay Director of Code Enforcement, Tim Higares, and Enforcement Officer Dave Rogowski, Mayor McLaughlin and Councilmembers Beckles and Booze went on the tour. ACCE members Deborah Price and Teijae Taylor narrated the tour of abandoned houses (most of which are bank-owned as a result of foreclosures) and other blighted areas in the neighborhood. Throughout the neighborhood well-kept houses and yards are surrounded by boarded up houses with garbage in the yards, vacant lots with waist-high dried grass and trash, and railroad tracks with no barriers. Deborah and Teijae talked about the negative effect of blight on the neighborhood which include lowered property values, demoralization in the community and serious safety issues. The abandoned houses and uncut grasses are serious fire hazards and create hidden areas that provide cover for criminal activities. The unfenced railroad tracks are ways into and out of the community for these same criminal elements. ACCE members presented specific demands to the city officials. They demanded that the city enforce the existing ordinance which fines banks and owners of abandoned properties $1000/day up to 30 days for each day that they do not maintain their empty houses and properties. They demanded city accountability by calling on the City Council to provide regular reports at council meetings on the city's $1000/day enforcement and ask the City Council to adopt a "Bank Responsibility Ordinance" to evaluate banks on community contributions and to make a commitment to do business with banks that are good community partners. They asked Code Enforcement to work with ACCE and other community organizations to pressure the railroads to fence their properties from residential areas. In response to the city's inability to keep up with the blight and keep the properties well-maintained ACCE demanded that the city use monies collected from fines on banks and other property owners to work with ACCE to create a "youth blight brigade" to identify, clean-up, and maintain abandoned properties in North Richmond, benefitting the community and providing employment for unemployed youth. City officials agreed the need was real and described a number of steps being taken to remediate the situation. They raised a number of difficulties in enforcing codes and cleaning up. While these difficulties may be real, the community must keep up pressure to see that the problems are dealt with as they come up. We can all help. Report abandoned or unmaintained foreclosed properties to Code Enforcement (510-621-1279). The call will be confidential. And then keep an eye on the area and be prepared to follow-up with city officials and ACCE (510-860-7614). The problem can't be solved without ongoing community involvement. Black and Brown Richmond women have started a series of dialogues to address the tensions that exist between the Black and Latino Communities. The first, called Building Bridges was sponsored BAJI (Black Alliance for Just immigration) The Latina Center, BWOPA (Black Women Organized for Political Actions), the City of Richmond Human Rights/Human Relations Commission, and the Neighborhood House of North Richmond and was held at the Booker T Anderson Center on June 25. The RPA was represented by Richmond City Councilmember Jovanka Beckles and Nicole Valentino, Community Advocate in the Office of Richmond Mayor Gayle McLaughlin, at the first of its kind event in Richmond. The event was designed to provide a safe retreat space for the healing and empowerment of Black and Brown women in the Richmond and West County community. The new North Richmond Green Newsletter highlights the efforts that the community, city, and county leaders have been making to create avenues and opportunities for people to get involved in cleaning up and beautifying the environment of North Richmond. It also sheds light on the "Green" direction that North Richmond is moving in, and on the steps that are being taken to combat illegal dumping and blight, in addition to other mitigation related issues. The Richmond City Council took an important step in bringing Richmond together by unanimously supporting the proposed program for Municipal IDs at its July 5th meeting. Responding to an outpouring of community support that centered in the Latino community but extending well beyond, the Council adopted a proposal by Councilmember Beckles and Mayor McLaughlin with details prepared by city staff. One particularly moving point was made by Amahra Hicks speaking for Black Alliance for Just Immigration (BAJI) who explained the historic natural alliances between African-Americans and Mexicans. During slavery in the US , Mexico gave support to escaping slaves. Millie Cleveland of the Service Employees International Union (SEIU) argued that the so-called immigration problem is primarily the result of US policies in Latin America creating both political and economic forces that drive people away from their homes. Eduardo Martinez pointed out that there may be cost savings from this program. With the ID cards establishing identity in certain circumstances, it will be less necessary for police to bring people into the station for simple identification. Police Chief Chris Magnus, in answer to questions, supported the program because of its effect in giving residents more security and less fear in dealing with the police. Beckles pointed out that nothing in this ordinance gave increased authority for the Police to demand IDs. But where they do have such authority, as in investigating crimes, the municipal IDs would reduce the fear of residents and even encourage people to seek out and cooperate with the police. The proposal still must pass a second reading at the City Council on June 19th before becoming law, but with a unanimous first vote no serious opposition is expected. After the ordinance is passed, the city will put out a request for bids from financial institutions to find one willing to take responsibility for the program. The ordinance is not a panacea. Richmond and the nation wait for the comprehensive immigration reform with a path to citizenship for undocumented workers promised by candidate Obama. It does not create the jobs that we need. It does not end racism and profiling. And it does not stop the exploitation of our community by banks. But it is an important step in insisting that all residents have rights; that all residents should be free from fear in dealing with government agencies. And in the process we may have made it little easier to deal with the everyday problems of life like receiving and cashing checks. A proposed arts complex in Richmond that combines progress and sustainability took a big step forward. Forty people heard A Vision for Progress, the Arts, and Sustainability in Richmond and participated in discussion sponsored by the RPA Arts committee on June 12. Frank Garvey, director of San Francisco's OmniCircus project is proposing the complex. OmniCircus would be 'anchor tenants' bringing in other Bay Area tech arts, and utilizing historic structures in the city. Most importantly, OmniCircus intends to re-locate and enlarge its unique surreal robotic installation, which will draw tourists from all over the world to Richmond for many years to come. Must listening for anyone who wants to understand how energy corporations win key community institutions and knock out opposition. In this case the subject is natural gas drilling in Pennsylvania, but it takes little imagination to see the parallels to Richmond. The first half describes how the state university and state government choose sides in the battle of profits versus toxic products entering the air and water supply. The second half describes a full scale PR war over zoning with the leaders of the local city greatly out-gunned. Can be downloaded free or for $.99. A small political theater company, Theater BAM!, finds itself at a crossroads: should they keep telling the stories they feel can change the world (and starve while telling them), or feed at the corporate trough, sell out, and be the mouthpiece for The Man. Tough decision. But before having to make it, they are offered an artistic commission that may save the company; all they have to do is create a new play, "2012 - The Musical!" But is it political? Will it keep with the company's original mission? What's the true purpose of this frivolous production, and who's really bankrolling the thing? This is a special Richmond production. For the full schedule. The play is free (although a collection will be taken). The Mime Troupe depends on volunteers. They need help with cooking, postering, and publicity for the show, and 4-6 people for both set up before the show, starting around 9:00 AM, and for the strike afterwards, which goes till about 5-6:00 PM.. If anyone has food donations, is willing to cook, can poster, or help the day of the show, please email Fletcher Oakes.